For a band, longevity is a double-edged sword. It means that an artist’s music has the power to sustain over time but it also means that evolution is necessary. Sometimes that progression is organic and slow while other times it’s urged, driven by a desire to change and grow. 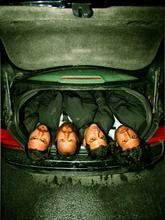 That is where we find Bay Area rock band Dredg today, on the brink of releasing their fifth album in over 15 years. The band’s new album, “Chuckles And Mr. Squeezy”, is a far cry from their 1998 debut Leitmotif—and even from their most recent disc, 2009’s The Pariah, The Parrot, The Delusion—but now, looking back, you can see a band who’ve transformed themselves again and again of their own volition. Part of this fresh approach arrived during the recording process, a relatively short period of time that forced the band to feel the sensations of their music rather than spend too much time perfecting them. The group spent two days at Studio Trilogy in San Francisco and one day at David Chloe’s art studio in LA recording in September and did the rest of the work at Dan’s home studio in the Bernal Heights neighborhood of San Francisco. The sessions were casual, focused on urging emotion from the music, with both spontaneity and rawness in the recorded takes. The band even used sounds from the demoing process on the actual album tracks, an extraordinary new method for them. The resulting album is almost like opening a new chapter of a book. The players are familiar and it still sounds like the work of the same artist, but the tones have shifted and the setting’s changed. There’s no concept in these songs, no real thread that connects them except that they capture the same moment in time for a group of individuals. The disc’s 11 tracks total out to only about 40 minutes, something that was intentional on the part of the band after Gavin did extensive research on the length of successful albums. There is no erudite theme in the lyrics; just Gavin’s personal experiences, which he extends to the listener in each song.